We are a small business located in Craftsbury, VT in the Northeast Kingdom, a business that was started in 1982. Our main products are feed equipment made by Patz or Valmetal and manure handling systems made by Patz, The conveyors and material movers we sell can be used for many different things. Lumber mills use them to carry away sawdust and scrap material. Loggers use them to load trucks with wood that has been cut and split for burning. Concrete plants use them to carry concrete and gravel to the mixers, and more and more of the industries are finding how well these movers work for their business. The most common use for the Patz Barn Cleaner is for taking manure from the barn to a holding pit, manure spreader or to a manure pump. The Airablo round Bale feeder is a very popular feeder, as it can work feeding your herd 24 hours a day if need be. More and more farmers are turning to the round bale as the Northeast has had some tough drying weather for conventional bales. The hay for round bales does not need to be completely dry for cattle. But these bales are big and heavy, so a bale feeder makes the feeding process a lot easier. The Zimmerman Vet Chute is a wonderful way to treat your animal for health reasons without getting killed. You herd the animal you wish to treat into the chute, close the door, and you have the ability to give shots, treat wounds, work on the feet, and the animal can't get away, can't run you over, or get you with their horns. 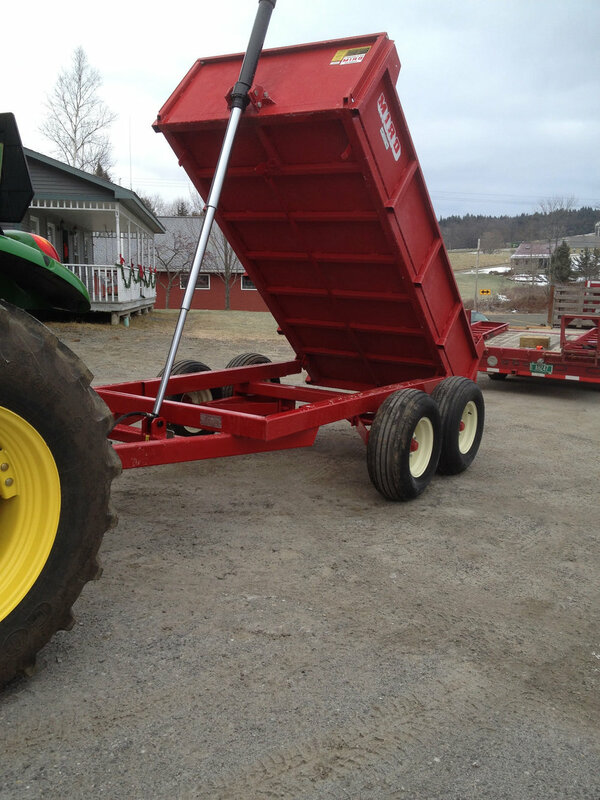 Rissler has a real nice Bale Unroller Feed Cart. Fits in tight spots and makes feeding time more enjoyable. Sturdy Built is the other source for stalls, headlocks, loop stalls, tie stalls and gates. The Miro off road trailers are well built and economically priced. Miro also has a great Bale Feeder that get your round bales up off the ground and less wasted feed. There are times when we have used equipment, check back often! We will come to your place, measure up and give you a free quote.